In the 1800’s, Pugs were bred with English Bulldogs to create, what was then called a “Toy Bulldog.” However these Toy Bulldogs quickly grew out of favor and by 1860, many were exported to France, primarily by traders and skilled craftsmen (lacemakers) who were relocating to France. In France, the dogs were cross-bred with various other, unidentified small breeds, and quickly became popular among women. In Paris, these new dogs were so adept at city living, and easy to care for, that their popularity grew even more so. 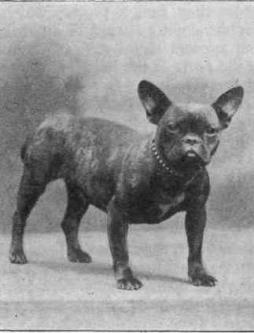 The French Bulldog had finally left its “ratting” (hunting of small game such as rats) and became a beloved companion animal. Their ears are a distinct feature which separates them from other bully-breeds. French Bulldogs can weigh up to 30 lbs and can live up to 12 years. Similar to the Great Dane, Afghan Hound, Sealyham Terrier and others; Frenchies are hard to find. So be prepared to wait on a breeders list for a while. However hard to get ahold of, once you do- a French Bulldog will prove to be a worthy guard dog, affectionate companion, well-behaved, alert and active but not overly playful. Frenchies don’t require a lot of exercise and adapt well to any living environment. Being a brachiocephalyc breed, French Bulldogs have a hard time in the heat. This is because, even though they have short hair- their muzzles are not long enough to cool the air as it passes through the airway, as it would in longer muzzled dogs like German Sheperds or Dobermans. Therefore limiting your Frenchies exposure to heat and being aware of any signs of heat stroke when outdoors for long periods of time, are one of the responsibilities of a Frenchie owner. At the same time, French Bulldogs are not very tolerant of cold weather either; due to their short hair and smaller stature. However there are plenty of dog shirts and jackets available to prevent your dog from getting cold. Overall, French Bulldogs are typically fantastic with all people and other animals. Although they do have some trouble being alone due to their want to be with their people. They are not a loud breed and will not bay, howl, or bark a lot like many hounds would. So if you’re looking for a friend to spend time on the couch with or to take a quick stroll with on a nice day, this is the dog for you. GOOD LUCK ON YOUR PUPPY SEARCH TAMMY! May you find the perfect Frenchie for you and Nicky! A few days ago, I took part in a public search for a local man who had been missing in our region. The man had been missing for 2 weeks and the family, desperate for answers, initiated a public search. Although law enforcement had brought in their own team, including dogs and helicopters, their search efforts came to no avail. An experience such as this, can truly wake even the most humble person to the fact that- humans are not always superior. It is with this undeniable truth that I now embrace an easily overlooked, yet undoubtedly unique service that only a canine can perform. 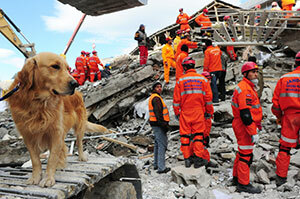 Search and Rescue Dogs or SAR’s, for short, are called upon during times of utter despair. Natural disasters, missing persons, mass casualties such as 9/11, and other situations which adhere to the urgency of life or death. Not only does time become a pressing issue for the people needing to be found, but also the environment for the dogs themselves can pose very dangerous risks. For example, in an urban earthquake situation where an SAR dog may be deployed, the dog is at risk of death should crumbling concrete fall on them, or a pile of debris shift below them and trap them as well. There are some breeds that are better suited for this type of work. A very common breed choice is the German Shepard, due to their versatility. Other breeds include: Golden Retrievers, Bloodhounds, Border Collies, and many brachycephalic breeds such as the Rottweiler and Boxer. However one cannot mention search and rescue without mentioning the longest forerunner in survival rescues: the Saint Bernard. The St Bernard is actually one of the oldest search and rescue breeds. This breed was originally bred for companionship to many monks of the mountain monasteries of the Swiss Alps. The St Bernard being a genuine companion, would often set about into the mountains along with the monks, refusing to leave their friends behind, and began to develop into the avalanche/mountain rescue relief that we know today. FEMA lays out some pretty strict guidelines when registering a dog for rescue work. Many organizations such as the American Rescue Dog Association have regulations of their own as well that dictate whether a rescue dog is “mission ready”; Along with many other localized state organizations. If you would like to help support some of these dogs, their handlers, or families in need of SAR services, check out the non-profit Search and Rescue Dogs of the United States. If you feel that your dog would be an excellent candidate for search and rescue work, I encourage you to reach out to a local training organization. If you aren’t sure whether or not your dog could be a four legged hero, click here to see a list of common characteristics and traits. I recently found myself sitting by a camp fire in conversation with a Chihuahua owner. We talked about “Peanut” and her mischievous ways. We joyfully discussed different dog breeds and origins. Yet when asked about the Chihuahua breed’s origin; I was finally stumped. I had absolutely no clue. My knowledge of dog breeds are a deep and vast well of information yet the little Mexican mascot’s origin had me at a loss. The owner and I began our research to find out, right then and there, and what we found out was amazing. I am going to share with you, the history of the Chihuahua and I am sure that you will find this information fascinating as well. I began my search on the internet, like most of the world’s population would do, and believe it or not; I couldn’t find much that was of any factual use. So I dug out my AKC Breed book circa 1992, that I received as a child. I opened the dusty cover and found myself suddenly on a rich and timeless adventure. Chihuahua’s are believed to have existed in their native Mexico since the 9th century. Although many records show their existence as early as the 5th century, it has yet to be accepted among the dog community as a whole. At the time of the 9th century and for several centuries after; the Toltec’s were inhabitants of the area and recorded much of a dog they called the “Techichi.” The dog was found depicted on stone carvings and remains were even found in gravesites along with human remains. The Techichi was small, with heavy bone structure and long hair. One of the most notable characteristics was that this breed was mute- as noted once in a letter from Christopher Columbus to the King of Spain. Upon the arrival of the Aztecs, a new chapter opened up for the Chihuahua. One very contrast and yet deeply meaningful. It was at this time that if a person were of a wealthy status, the Techichi would be kept as a beloved and adored house pet. However if you were of a lower class; these Techichi’s were instead eaten as food. Both the Toltec’s and the Aztec’s placed high religious value on the Techichi. There were often great ceremonies involving the Techichi. The dog was believed to purify the soul, a protector from evil spirits, a guide for a soul during the transition into the afterlife, and much more. It is believed that the Chihuahua is undoubtedly derived from the Techichi, and although color variations have undergone tremendous changes, at one point having a ‘blue’ color, the breed itself essentially has only been variated once, and bred with the Chinese Hairless to create the smooth coated Chihuahua. The Chihuahua is described as “clannish.” Meaning that it recognizes and prefers dogs of its own kind and is generally unaccepting of dogs of other breeds. The smooth coated is most numerously found in the United States which indicates that this is in fact the most prefered type. The history of the Chihuahua is rich indeed. It is a marvelous tale that spans centuries. Uncommon to other dog breeds which variate over decades, the Chihuahua proves to be one of the oldest dog breeds. The Chihuahua full of culture, history, and personality- still thrives today. So you have decided to get a dog. Congratulations! You are on your way to experiencing a world of love, joy and dedication. There are so many dogs out there that it gives you a headache trying to pick just one. Maybe you’ve found yourself in the middle of a litter of puppies and they are ALL so cute! How to choose!? You’re beside yourself with excitement, emotions and puppy breath. It is for this reason that I have been asked to discuss what NOT to look for when buying a dog. What are your needs in a dog? Assuming that you have not in fact made it to the comfortable spot on the floor yet, surrounded by tumbling puppies; the first stage in finding a four legged match requires 100% honesty on your part. It is important to find a dog that matches your lifestyle. Are you an avid hiker and outdoorsman? Consider a spaniel or retriever. Are you more of a homebody? A less active dog would be appropriate. Are you looking for a running/jogging partner? Matching your needs alongside a dog is probably the most important aspect to consider. If you work a lot and are away from home for most of the day, a high energy dog should not be considered. If you are allergic to pet dander, check out some of the hypoallergenic breeds like Poodles and Irish Terrier. If you plan on doing a lot of travelling with your pet, be considerate of your pets size and needs. Although funny, it would not be humane to have to stuff your Great Dane into your 2 door coupe with his head protruding out of the sunroof. Maybe you want an elegant Maltese to help show your sophisticated side, that you can fit into a handy carrier without issue. Furthermore, male canines have some differing behaviors from females as well, so do a bit of research or talk to a veterinarian or trainer for more information. Identifying your needs in a dog will prove to be the most worthwhile effort in the long run. If you consider nothing else, consider at least this one factor. What are you able/ willing to commit to a dog? Identify how much time and resources you have. Do you have people that can watch your dog for you if you need? Do you have the right amount of income for the breed that you are considering? Certain breeds like Great Danes, Newfoundlands, and St. Bernards have considerably higher vet and food bills; due to their large size. Also some breeds are more prone to health issues. If you cannot wrap yourself around the idea of having to train a puppy and dedicate all of your time to correcting behaviors and mopping up pee spots, you should consider adopting an older dog. Maybe you want a dog for simple companionship; one that is well adjusted. Consider adopting a senior dog. Senior dogs have ran the gamut of exposure and experiences in their lives and often have more confidence, patience and acceptance. Are you going to be able to train the dog or will you be considering a professional trainer? Should a behavioral problem arise, what courses of action would you be willing and realistically able to take? Having an idea of the bigger picture, will help narrow down much of the daunting list of available canines out there. Pretend for a moment that I am Mexican and you are Irish. My parents are from Tijuana; yours from Dublin. Although we are both human, I may have a tendency to be less tolerant of cold weather due to my genetics. Being Irish, you may occasionally find yourself wanting corn beef hash and cabbage. You don’t know why, but you just cannot stop searching restaurant menus online to see who has some really good corned beef hash and cabbage! This is the same with dogs. 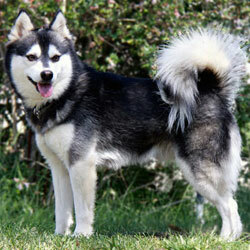 There are certain “tendencies” that each breed develops based on their genetic history that differ from other breeds. A St. Bernard would be okay in cold climates with his thick coat. A Coonhound can’t help but watch every little squirrel and critter that goes running by. All dogs use their nose and sense of smell but a Bloodhound may have a tendency to use that before any other sense. So consider the tendencies a breed may have. Identify whether any of those traits will be an issue for you. If you do not like a lot of barking and baying, do not consider a beagle or hound, for example, because these dogs have a genetic tendency to use these vocalizations. If you are unsure, contact a dog trainer or behaviorist, who can help you understand breeds better or visit a shelter and meet them firsthand. Do some research, because in the long run this will help avoid a lot of difficult situations for you and your potential dog. Although I have just spoke in depth about the importance of considering breed, it is also just as important to NOT consider the breed. Don’t let the breed type be the -end all be all- in your decision making. Using the same analogy of a Mexican and an Irish person, you cannot negate the fact that both are still human beings at the end of the day. Both will need food, love, and shelter. Both see the doctor when they are sick, both laugh and have friendships, etc. Many people buy from a breeder because they want a true blooded bird dog, for example, or a quick legged Greyhound. However, not all dogs are what you read in books (if that’s even a thing anymore) or hear about. To make my point I will share with you a story that is not for the faint of heart. It is a true story that exemplifies to the letter, of why it is so important to NOT look solely at breed. 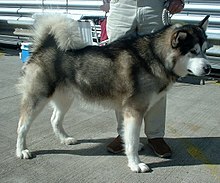 There was a very sweet, young, intelligent, loving Husky/Malamute mix purchased for mushing (dog sledding.) He was trained (albeit poorly) in the art of mushing and lived the lifestyle of a sled dog. Whenever his harness was put on him, he would lay down in refusal. He did not want to pull a sled, and he would be abused as punishment for his refusal. He had scars on the sides of his body, and on his face from whipping. Thankfully, the owner surrendered the animal after 2 years, and the animal is now in a loving home where he is treated with utmost value, love and respect. The moral of the story is, just because the dog is a husky, doesn’t necessarily mean he will pull a sled. Just because the dog is a Brittany Spaniel, doesn’t mean he will flush and find birds. So remember that a dog, regardless of the breed, will have the same needs as any other dog, and remember as well the importance of not selecting a breed as an end all be all way of choosing a pup. This is a theory that makes me uncomfortable. Imagine you are out in a club with your friends and you see someone that peaks your interest. You move towards them and begin to engage them in conversation. Think honestly for a second, and tell me what trait you were feeling at the moment you approached. Confident? Maybe you go to this club all the time and have never recognized this person before. Are you feeling somewhat territorial? Is it out of aggression that you’ve approached? What made you so comfortable that you were drawn like a magnet to this person? All of these words described above, when used to describe a dog, is summed up by the word “dominant.” Dominant, in terms of a dog or animal, has become in our world today to be a very, very negative label. Many professionals feel that when choosing a dog, to in fact not chose the dog that directly approaches you or “chooses you” first; since this act shows the trait of dominance. The reason that this ideology makes me uncomfortable is because with proper instruction, dominance can be corrected. In fact, there is no better time for it to be corrected than in those young, and influential puppy stages. However, not everyone is able to be a responsive dog owner. Not everyone is able to take the time to correct each dominant behavior and some may not even be able to recognize what is dominant behavior and what is not. Therefore, professionals keep it simple by stating to in fact pick a different pup than the one whom approaches you first. You would look for a dog that acknowledges you but also is comfortable resuming play or other activities that may take their attention. Adopting from a shelter or rescue group can help your decision making process simpler because of the fact that they have had exposure to the animal and are able to tell you certain traits or behaviors that may or may not be ideal for your life. It happens, more often than people think, that someone you know, finds themselves in a desperate situation and can no longer care for their dog. Suddenly someone is unemployed, or they are being evicted. In the instance where you find yourself with a dog being thrown your way, or if you find that your new dog is not jiving with you or your life, consult an appropriate dog trainer. If you find that you honestly have no want or need to care for a dog, (as some people do) then take a trip to your local animal shelter or call your local animal control officer and forfeit the animal. Not only would you be doing the right thing, but you would be doing what is best for you and for the dog. Thanks for reading. I hope this information helps in some way. And a huge high five to you for educating yourself before making such a big decision. That’s already being a great dog owner!